Ibrahim Mansour was born around 1860 AD in the city of Cairo from an honourable and distinguished family known as “Fanous the Great”. When he grew up he joined the “General Patriarchal School” in Azbakia where he was educated and graduated thoroughly perfected in sciences and knowledge. He had predisposition towards serving humanity and advancing its cause. These talents had lent him to join the Medical School and to gain the love of his friends and the trust of his tutors. 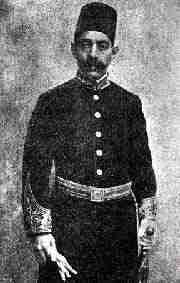 He was appointed as Physician for the Coptic Patriarchal House by a decree fromToufik Pasha (the past Khedive) thePrincipal of Internal Affairs (nowadays Minister of the Interior) at the time. He carried the burden entrusted to him to the utmost best and tended the poor with great services. He was the only practicing Coptic doctor of the time. Moreover, immediately following his graduation he converted his house at 50 KluteBek Street, Cairo into a clinic to treat patients freely and also offered them free medications with the co-operationof his friend and colleague Dr AzerFouzithe owner of a pharmacy in Bab El-Hadeed. Thus, the care for the poor had been rooted in his character since his early age. In 24 August 1891 the “Tawfic” society was founded in Cairo. It was a sort of a second renaissance following the first revolutionary revivalprompted by the honourably remembered and the undying example, the“Father of Reform” Pope Cyril the Fourth the 110th Patriarch. In July 1895 Dr Ibrahim aquired for the society the 6162 square meters “Selehdar” palace in the “Ratley Lake” area of the “Faggalah” precinct. At a time when the budget of the society did not exceed 50 Egyptian pounds, he spent 600 pounds off his private account which compelled him to pledge some of his personal belongings as a guarantee for repayment for the remainder of the price. The property had become a residence for the society and a centre for its various activities. They moved into it the “Tawfic” printing press, previouslylocated in his “Klute” Bek clinic and equipped the press with a variety of modern printing machines and letters in Arabic, English and Coptic. With widely spreading reputation the print-housewas publishingmany journals and magazines amongst which are; the daily “Egypt” newspaper, the “Tawfic” magazine, the “Coptic” magazine, the “The Honour” magazine, the “Christian Unity” magazine, the “Path of Life” magazine, the “Coptic Youth” magazine, the “Heliopolis” magazine, the “Scales of Moderation” magazine, the “Flowering Orchard” magazine and the “Zion” magazine. Considering his dedicated interest in the advancement of the society and his efforts to revive it, the members elected hima president to become the fourth Chairman of the society’s board of directors throughout the entire period from May 1896 until January1917 when he was caught with illness. From then he was elected an honorary president for life. During his presidency he managed to establish a school for the education of girls, laying its foundation stone on Thursday 2 January 1907. On that day, at 3oclock in the afternoon the occasion was celebrated in the presence of the honourably remembered Pope Cyril the Fifth the 112th Patriarch and delegates from the clerics and members of the “Synod of Laity” with participation from the royal music band. Dr Ibrahim Mansour introduced the festivity stating that the purpose of such a splendid building was to make it a girls’ school together so that all the society’sinterestsaregathered into one place i.e. a society’s residence which incorporates the two schools for boys and for girls and also the school for industries. He gave thanks to the pope for attending as promised. Afterwards, Mr Gendi Ibrahim read the proceedings which were recorded to be signed by the attendees and put in a box together with samples of the papers, magazines and currencies that were in circulation at the time. Having been read, the pope signed the document and, through his deputy he first thanked the society then praised the works of Dr Ibrahim Mansour. After the schoolchildren had sang happy songs a young pupil gave a speech in the Coptic language which was translated into Arabic by another pupil.Finally the pope got up amongst hymns from the deacons, ascended the steps to the place prepared for the foundation stone and with his own hands laid the corner stone for that cultural establishmentthen left afterwards. Dr Ibraheem Mansour had great interest in the annual celebrations of “Nerouz” (the Coptic New Year) holding its biggest party in the society’s headquarters. Also the Society’s board of directors, having met on 2 January 1901 has agreed to the proposed project of establishing a pharmacy with the collaboration of Dr Ibrahim Mansour and Dr AzerFouziunder the name “El-Tawfic pharmacy” forthe free therapy and treatment of the poor. The pharmacy was opened at 5oclock in the afternoon of Sunday 10 March 1901 with an opening ceremony introduced by a speech from Dr Ibrahim, the society’s president. “The Charitable Endeavours Society” was founded on the year 1881 and was headed by the late Botros Pasha Ghali. In 1908 the society established a Coptic health clinic and for this purpose the honourably remembered Pope Cyril the Fifth had generously donateda small building in “Shak El Teban (the snake’s crevice) lane at KluteBek Street. The clinic was opened on the beginning of October 1908 and was solely dedicated for the treatment of the society’s poor. The honourable doctors who had volunteered to serve in it were; Dr Ibrahim Bek Mansour, Dr Ibrahim BekFahmy El-Menyawi, Dr Francis Effendi Badeer, Dr IskandarBekFahmyGergawi and Dr Rashed Effendi Youssef. They formed a committee under the presidency of Dr Ibrahim Mansour for the management of the clinic. By the beginnings of 1910 the society realised that the generalisation of charity and expanding it was amongst its supreme aims and so it was decided to open its doors for the free treatment off all the poor with no exception whether they were of the society or otherwise according to the principle that “humanity is indivisible”. Afterwards the society established the first Coptic hospital (instead of the clinic) in 1911, then the second Coptic hospital instead of the first, housed at Queen Nazli Street (currently Ramses Street) in 1913, then the third Coptic hospital in its current premises at Ramses Street in 1927. In 1902 the Coptic Youth Society had been established with its national club to assist young people to gather for reading, sports and literary debates instead of being involved in amusements, vices and liquors. Various clubs were founded in Asyout, El-Mansoura, Tanta and other cities. The society was committed to the Egyptian and patriotic principals regardless of religion or denomination. It had no sectarian affiliations and hence was joined as honorary members by Ali Pasha Refaa, Seleem Pasha Hamdi, Mikhail BekSheroubim, NakhlaBek Youssef, the solicitor Ismail BekAssem, YacoubBekNakhlaRafeelah, Dr Ibrahim Bek Mansour and others. He was elected as representative in the third and fourth synods of laity in 1892 and 1906. He attained the fourth rank in 1892 then the third rank in 1895 and then the second rank in 1905. He also received the “Star Insignia” of the third degree from his majesty the emperor of Ethiopiaas a reward for his great services. He also received the “Bekship” during the rule of Khedive Abbas the Second. He wrote many books among which his famous dictionary entitled “The Medical Dictionary” in both Arabic and English languages which included all that concernedMedical Practitioners. Also a book in “Domestic Medicine” in two volumes containing many useful health advices which were published in 1894 and 1893. He also published the book “The Medical Requirements” in three huge illustrated volumes, in the first of which he wrote in the introduction “..the motive for writing this book was that one day I was invited to visit some families in the capital when I saw a girl aged five laying in her parents’ arms bleeding severely from one of her legs. I was amazed at the sight and inquired about the cause for the bleeding. I was told that the daughter was playing with scissors that hit her leg and injured it. I was very sorry for this accident and for the parents’ ignorance of the basic health procedures which, if they were aware of them would have saved her from danger. Therefore I realised the need of the public for small medical bookletsto instruct them in the treatment of simple ailments and help them to avoid many incidentssuch as this that hardly requires a doctor. For this purpose I have chosen the majority of the treatment methodsthat families need to know and explained it to them in easy demonstrations that are close to understanding and can be perceived by the specialist and the lay. In my collection I relied on my 25 years of experience in this noble craft then added to it my approved selections from Arabic and English books”. That volume was made of 544 medium sized pages containing several anatomical illustrations. Doctor Ibrahim Mansour was one of those unique men who served science and humanity and dedicated their time and money to improve their country and reform its affairs. He always enjoyedjovial countenance, modesty, kindness and prudence. He was a model for sincerity and natural inclination to serve the miserable of humanity.In 1930, at 70 years of age his leaping spirit had taken off to the immortal world to enjoy eternal repose where God dwells with people!